Ecce Homo ("Behold the Man! "), Antonio Ciseri's depiction of Pontius Pilate presenting a scourged Jesus to the people of Jerusalem. Pontius Pilate (pronounced /ˈpɔnʧəs ˈpaɪleɪt/; Latin: Pontius Pilatus, Greek: Πόντιος Πιλάτος) was the governor of the Roman Iudaea province from 26 -36 C.E. He is best known as the man who, according to the canonical Christian Gospels, presided over the trial of Jesus and ordered his crucifixion. Other details are provided by the Jewish historian Josephus, who reports him to have engaged in ruthless suppression of Jews and Samaritans when elements of these groups displayed disloyalty to Rome. After a particularly harsh action against a Samaritan messianic movement sometime after the death of Jesus, Pilate's administration came under criticism and he was recalled to Rome. Although sometimes portrayed sympathetically because of his reported reticence to condemn Jesus, Pilate has become emblematic of the person who “washes his hands” of responsibility rather than taking a stand for justice. Pilate's date and place of birth are unknown. He is commonly believed to be descended from Gaius Pontius, a Samnite General. Pilate's title is traditionally given as procurator. The Roman historian Tacitus speaks of him as such, but the title may be anachronistic. An inscription on a limestone block—apparently a dedication to Tiberius Caesar Augustus that was discovered in 1961—refers to Pilate as "Prefect of Judea." Iudaea Province in the first century included Judea, Samaria, Idumea, and other smaller territories. The title used by the governors of the region varied over the period of the New Testament. Herod the Great ruled the area directly as a Roman client king until his death around 4 B.C.E. The territory he governed was split among his sons, but none of them was allowed the title of king. When Samaria, Judea, and Idumea were amalgamated into the Roman province of Iudaea, from 6 C.E. to the outbreak of the First Jewish Revolt in 66, officials of the Equestrian order (the lower rank of governors) ruled the province on Rome’s behalf. They held the Roman title of prefect until Herod Agrippa I was named King of the Jews by Claudius. After Agrippa's death in 44 C.E., Judaea reverted to direct Roman rule. The governor then held the title procurator, although the function of this office seems virtually identical with prefect. The procurators' and prefects' primary functions were military, but as representatives of the empire they were also responsible for the collection of imperial taxes. They had limited judicial functions. Other civil administration lay in the hands of local government: the municipal councils or ethnic governments such as—in the district of Judea and Jerusalem—the Sanhedrin and the high priest. The power to appoint the high priest, however, lay not with the Sanhedrin but with the prefect of Iudaea in Pilate's day. This conforms with the Gospel accounts of close cooperation between the high priest's group and Pilate during the trial of Jesus. Normally, Pilate resided in Caesarea but traveled throughout the province, especially to Jerusalem, in the course of performing his duties. During the Passover, a festival of deep national, as well as religious significance for the Jews, Pilate would have been expected to be in Jerusalem to keep order. However, he would not ordinarily be visible to the throngs of worshipers because of the Jewish people's deep sensitivity to Gentile interference in their religious rites. As governor of Judaea, Pilate would have small auxiliary forces of locally recruited soldiers stationed regularly in Caesarea and Jerusalem, and temporarily anywhere else that might require a military presence. The total number of soldiers at his disposal numbered in the range of 3000. For larger military needs, he would be dependent on the support of his superior, the Roman legate of Syria. On one occasion, when the soldiers under (Pilate's) command came to Jerusalem, he made them bring their ensigns with them, upon which were the usual images of the emperor. Roman battle standards were considered idolatrous by the Jews. The ensigns were brought in secretly by night, but their presence was soon discovered. Immediately multitudes of excited Jews rushed to Caesarea to petition him for the removal of the obnoxious ensigns. He ignored them for five days, but the next day he admitted the Jews to hear their complaint. He had them surrounded with soldiers and threatened them with instant death unless they ceased to trouble him with the matter. The Jews then threw themselves to the ground and bared their necks, declaring that they preferred death to the violation of their laws. Pilate, unwilling to kill so many, succumbed and removed the ensigns. Pilate is also mentioned in the Testimonium Flavianum—contained in manuscripts of Josephus’ works but believed by most scholars today to be a later addition—which states that Pilate ordered the crucifixion of "Jesus," whom the writer identifies as "the Christ." The passage is considered suspicious because Jesus is mentioned nowhere else in Josephus' writings, which would be highly unlikely if the author indeed thought him to be the Messiah. In approximately 36 C.E., several years after the crucifixion of Jesus, Pilate moved ruthlessly to quash what appears to have been an armed Samaritan religious procession that he apparently saw as a messianic uprising. Many Samaritan lives were lost in the process, and Pilate's behavior was considered much too harsh. After complaints to the Roman legate of Syria, Pilate was recalled to Rome, where he disappears from historic record. Luke 13 refers to "Galileans whose blood Pilate had mixed with their sacrifices." Although the reference is not specific, it could relate to the suppression of demonstrations such as those mentioned in Josephus, above. Pilate is best known, however, for his role in the condemnation and crucifixion of Jesus. 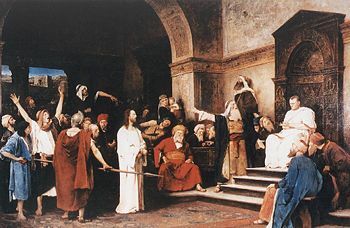 According to the canonical Gospels, Pilate presided at one of the trials of Jesus, who was brought to him by the high priest and other Jewish leaders who had arrested Jesus and questioned him at a private residence during the night. Despite stating that he personally found him not guilty of a crime meriting death, Pilate ordered Jesus' crucifixion. The Gospels differ in their reports about Pilate’s precise role in the drama. 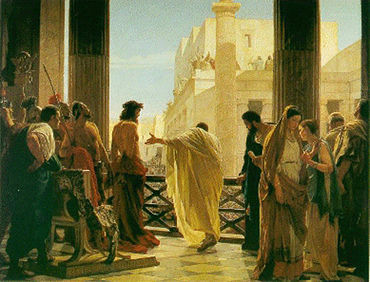 In Mark, Pilate’s main question to Jesus was whether he considered himself to be the King of the Jews, and thus a political threat (Mark 15:2). In Luke’s version, Temple authorities had decided that he was guilty of blasphemy, but brought him to Pilate to accuse him further of sedition against Rome. The Gospel of Luke alone reports that Pilate handed Jesus over to the jurisdiction of Herod Antipas for judgment on the grounds that Jesus was a Galilean and thus under Antipas' jurisdiction. Pilate nevertheless had Jesus publicly flogged and then executed by crucifixion as a traitor to Rome. John 19 reports that Pilate was concerned that if he let Jesus go, his reputation in Rome would suffer. He thus "had a notice prepared and fastened to the cross" as a example for other would-be messiahs and their followers. It read: "Jesus of Nazareth, King of the Jews." Matthew 27 reports that Pilate turned Jesus' body over to Joseph of Arimathea—a wealthy man who was a disciple of Jesus and is identified in Mark 15:43 as a member of the Sanhedrin—for burial. In all New Testament accounts, Pilate hesitates to condemn Jesus but orders his death after the crowd insists. John 19:12 reports: "Pilate tried to set Jesus free, but the Jews kept shouting, 'If you let this man go, you are no friend of Caesar. Anyone who claims to be a king opposes Caesar.'" A number of modern scholars, Christian and secular alike, have suggested that this part of the story may have been an effort by early Christian writers to distance themselves from the Jews, who themselves had rebelled against Rome around the time of the Gospels’ writing. Nevertheless, in 325 C.E. the Nicene Creed incorporated the clause “crucified under Pontius Pilate" in a statement of faith that was intended to be authoritative for all Christians in the Roman Empire. Pilate as philosopher: "What is truth?" A body of legend has grown up around the figure of Pontius Pilate. The fragmentary apocryphal Gospel of Peter exonerates Pilate of responsibility for the crucifixion of Jesus, placing the blame squarely on Herod Antipas and the Jews. The fourth century apocryphal text known as the Acts of Pilate gained wide circulation in the Middle Ages, when it was also known as the Gospel of Nicodemus. Its first section (1–11) contains a fanciful and dramatic account of the trial of Jesus, based upon Luke 23. The Ethiopian Church recognized Pilate as a saint in the sixth century, based on the account in the Acts of Pilate. A letter purportedly from Pilate to the Emperor Claudius can be found in the apocryphal Acts of Peter and Paul. Eusebius (Historia Ecclesiae ii: 7) quotes some early apocryphal accounts which relate that Pilate fell under misfortunes in the reign of Caligula (37–41 C.E. ), was exiled to Gaul, and eventually committed suicide there in Vienne. The Mors Pilati ("Death of Pilate") legend treats Pilate as a villain. The narrative begins with an illness of Tiberius, who sends to Judea to find Christ, who can bring about a cure. Pilate hides the fact that Christ has been crucified and asks for a delay. Tiberius’ messenger, however, encounters Saint Veronica, who informs him of the truth and sends him back to Rome with her kerchief, which heals Tiberius. 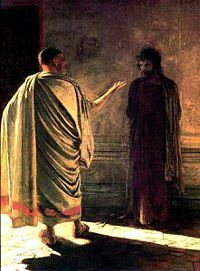 The emperor then summons Pilate for punishment, but Pilate appears, before him in the very robe of the Christ and Tiberius' heart is softened. Once Pilate removes the garment, however, he is immediately executed. The Mors Pilati ("Death of Pilate") relates that his body was thrown first into the Tiber, but the waters were so disturbed by evil spirits that the body was taken to Vienne and sunk in the Rhône. A monument at Vienne, called Pilate's tomb, is still to be seen. As the waters of the Rhone likewise rejected Pilate's corpse, it was reported removed again and sunk in the lake at Lausanne. The corpse's final disposition was supposedly in a deep and lonely mountain pool overlooking Lucerne. Every Good Friday, the body is said to reemerge from the waters and wash its hands. Pilate often has a role in medieval mystery plays. In the Eastern Orthodox Church, Pilate’s wife, Claudia Procula is commemorated as a saint, because in the Gospel accounts she urged Pilate against convicting Jesus. In some Eastern Orthodox traditions, Pilate committed suicide out of remorse for having sentenced Jesus to death. Plays and movies dealing with life of Jesus Christ often include the character of Pontius Pilate. His character is variously portrayed. For example, in the classic work of the Russian writer Mikhail Bulgakov, The Master and Margarita, he serves allegorically as a model of the people who "washed their hands" by silently or actively condoning the crimes of Joseph Stalin. A similar reference is found in the Rolling Stones' song Sympathy for the Devil in the verse: "Made damn sure that Pilate washed his hands, and sealed his (Christ’s) fate". The imperial bureaucrat has retired to Sicily to become a gentleman farmer in the Anatole France short story "The Procurator of Judea’’. Notable figures who have played Pontius Pilate in various dramas include Telly Savalas (The Greatest Story Ever Told), Rod Steiger (Jesus of Nazareth), Hurd Hatfield (King of Kings), Frank Thring (Ben-Hur), Richard Boone (The Robe), Gary Oldman (Jesus), and Arthur Kennedy (Barabbas). Bulgarian actor Hristo Naumov Shopov portrayed Pilate in Mel Gibson's The Passion of The Christ, while British musician David Bowie played the character in Martin Scorsese's controversial The Last Temptation of Christ. Jean Gabin portrayed Pilate in the 1935 French film Golgotha. Barry Dennen played the harried, hesitant version of Pilate in both the Broadway and film versions of Jesus Christ Superstar. ↑ The Trial of Jesus: Key Figures law.umkc.edu. Retrieved May 1, 2008. ↑ Administrative and military organization of Roman Palestine www.usd.edu. Retrieved May 1, 2008. 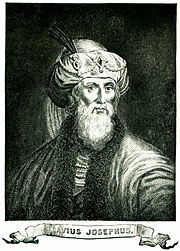 ↑ Josephus, Wars of the Jews 2.9.2-3; Antiquities of the Jews 18.55-59 www.perseus.tufts.edu. Retrieved May 1, 2008. ↑ Pontius Pilate from the Catholic Encyclopedia Retrieved May 1, 2008. This page was last modified on 28 March 2019, at 16:34.